It's something we've seen on my chart recaps time and time again - later singles from a big album not being able to manage chart positions as high as the first couple of tracks lifted. Sometimes, it's because the third or fourth single just wasn't very good. 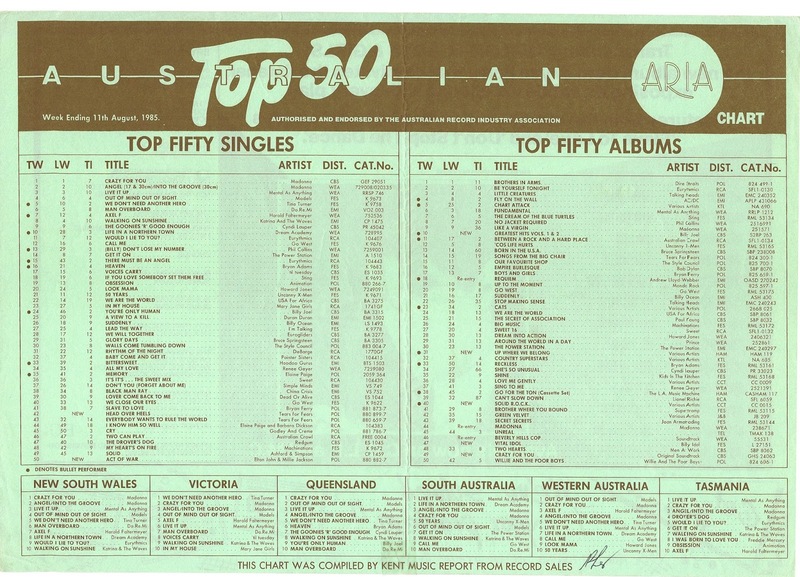 But when you're talking about hit-laden albums like Bad, Faith, New Jersey and Whitney - which all boasted several big international hits - it was more usually the case that Australia didn't have the population to generate healthy album sales and multiple hit singles. This week in 1985, the fourth single from an album that'd already peaked at number 5 and spent 19 weeks on the albums chart faltered outside the singles top 20 - and it was a song that was another huge success for the band in question overseas. Not only that, but the song has endured as a bona fide '80s classic that I'm sure most people would now assume performed much better in Australia. An artist who had no problem notching up one top 5 smash after another (probably because she didn't limit herself to releasing singles from her then-available studio album) was Madonna, who held strong for a third week at number 1 with "Crazy For You" and number 2 with former chart-topper "Angel/Into The Groove". This American country singer didn't ever cross over to the Billboard Hot 100, so it's interesting she achieved a top 100 placing here. Hillary has since found gainful employment as a songwriter for other artists and an author. Previous single "Boom Box" made the top 40, but this follow-up named after actress Audrey Hepburn didn't find as receptive an audience for the local synthpop act who were never seen on the top 100 again. Elton John has recorded a lot of duets in his decades-long career - he even released a whole album of them at one point - but this single is probably one of the least remembered of his many collaborations. In fact, I don't think I'd ever heard it until now. Released between the Breaking Hearts and Ice On Fire albums (and included as a bonus track of the CD version of the latter), "Act Of War" isn't exactly "Don't Go Breakin' My Heart". It's not even as good as "Flames Of Paradise", but probably compares favourably with "Through The Storm". Reportedly offered to Tina Turner first, the rather aggressive-sounding song ended up being recorded with Millie Jackson, who'd been releasing music to little fanfare since the early '70s and was no relation to the famous music family, although her daughter, Keisha, released a couple of albums between 1989-1991. Despite the exposure offered by appearing on an Elton John single, Millie probably has the lowest profile of any of his duet partners - although some of her '80s album covers have provided her with a certain infamy. 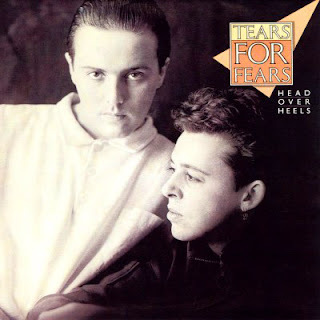 So far in 1985, they'd had a number 1 ("Shout") and a number 2 ("Everybody Wants To Rule The World", which was kept from the top by "We Are The World") - but thanks to the pattern I mentioned at the start of this post (aka the law of diminishing returns), the next single by Tears For Fears was a relative failure. The fourth track lifted from Songs From The Big Chair (first single "Mothers Talk" didn't make the top 100 locally), "Head Over Heels" peaked outside the ARIA top 20 despite reaching number 3 in the US and number 12 in the UK. 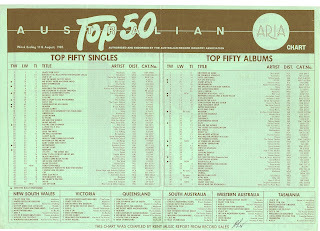 It's certainly a good enough song and would've been all over the radio at the time, but it would appear that a good number of people already owned it on the album or were prompted to buy Songs From The Big Chair, which returned to its number 5 peak in September and stayed on the albums top 50 until December. After the issue-driven "Shout" and "Everybody...", "Head Over Heels" was something completely different from the band - a love song, which was brought to life in the memorable library-set music video. Also memorable: the keyboard hook, which had first appeared in "Broken", the B-side to Tears For Fears' earlier single "Pale Shelter", and would be utilised 21 years later by Rogue Traders in "In Love Again". Next week: the song that was synonymous with MTV in the '80s, plus Prince makes up for his previous single and the debut of a promising Australasian synthpop act. 'Head Over Heels' is one of those songs I knew without realising I knew it. Someone mentioned to me over 10 years ago that it aired on the then retro music show on Victoria's community TV channel, Chartbusting 80s, and I didn't know the song by its title... until I heard it a year or so after that and realised it was THAT song. It is quite surprising that it only peaked at #21 here. Never knew they recycled a b-side hook for this track; how very S/A/W of them! I've never been an Elton fan, but know of Millie via her several infamous album sleeves that were doing the rounds in those 'worst album covers ever' posts 5-10 years ago.